^ Lewis, M. Paul (编). Ethnologue: Languages of the World (online) 16th. Dallas, TX: SIL. 2009 [15 September 2010]. Ian Hancock's 1987 estimate for 'all Gypsies in the world' was 6 to 11 million. ^ EU demands action to tackle Roma poverty. BBC News. 5 April 2011. ^ The Roma. Nationalia. [20 November 2015]. ^ Rom. Encyclopædia Britannica. [15 September 2010]. ... estimates of the total world Romani population range from two million to five million. ^ The Marginalization of Shadow Minorities (Roma) and Its Impact on Opportunities. Books.google.com: 117. [2016-07-27]. ^ Kayla Webley. Hounded in Eurㄡope, Roma in the U.S. Keep a Low Profile. Time. 13 October 2010 [3 October 2015]. Today, estimates put the number of Roma in the U.S. at about one million. ^ Falta de políticas públicas para ciganos é desafio para o governo [Lack of public policy for Romani is a challenge for the administration]. R7. 2011 [22 January 2012]. （原始内容存档于2012-01-11） （葡萄牙语）. The Special Secretariat for the Promotion of Racial Equality estimates the number of "ciganos" (Romanis) in Brazil at 800,000 (2011). The 2010 IBGE Brazilian National Census encountered gypsy camps in 291 of Brazil's 5,565 municipalities. ^ Türkiye'deki Kürtlerin sayısı! [The number of Kurds in Turkey!]. 6 June 2008 [2 January 2016] （土耳其语）. ^ Türkiye’deki Çingene nüfusu tam bilinmiyor. 2, hatta 5 milyon gibi rakamlar dolaşıyor Çingenelerin arasında. Hurriyet. TR. 8 May 2005 [2 January 2016] （土耳其语）. ^ The Situation of Roma in Spain (PDF). Open Society Institute. 2002 [15 September 2010]. （原始内容 (PDF)存档于1 December 2007）. The Spanish government estimates the number of Gitanos at a maximum of 650,000. ^ DiagnÃ³stico social de la comunidad gitana en EspaÃ±a (PDF). Msc.es. [2016-07-27]. ^ 2011 census data, based on table 7 Population by ethnicity, gives a total of 621,573 Roma in Romania. 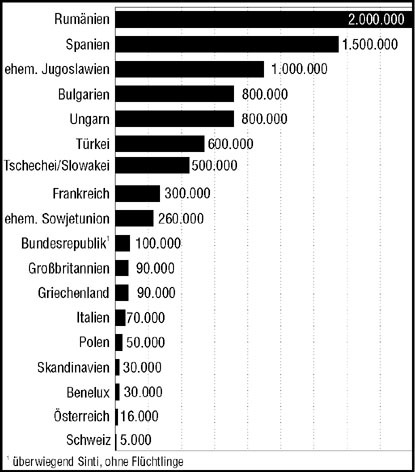 This figure is disputed by other sources, because at the local level, many Roma declare a different ethnicity (mostly Romanian, but also Hungarian in Transylvania and Turkish in Dobruja). Many are not recorded at all, since they do not have ID cards . International sources give higher figures than the official census(UNDP's Regional Bureau for Europe 互联网档案馆的存檔，存档日期2006-10-07., World Bank, International Association for Official Statistics 互联网档案馆的存檔，存档日期2008-02-26.). ^ Situation of Roma in France at crisis proportions. EurActiv Network. 7 December 2005 [21 October 2015]. According to the report, the settled Gypsy population in France is officially estimated at around 500,000, although other estimates say that the actual figure is much closer to 1.2 million. ^ Gorce, Bernard. Roms, gens du voyage, deux réalités différentes. La Croix. 22 July 2010 [21 October 2016]. [MANUAL TRANS.] The ban prevents statistics on ethnicity to give a precise figure of French Roma, but we often quote the number 350,000. For travellers, the administration counted 160,000 circulation titles in 2006 issued to people aged 16 to 80 years. Among the travellers, some have chosen to buy a family plot where they dock their caravans around a local section (authorized since the Besson Act of 1990). ^ Hungarian Central Statistical Office Census Data 2011. Retrieved 28 March 2013. ^ Michael Kimmelman. In Hungary, Roma Get Art Show, Not a Hug. The New York Times. 6 February 2008 [7 December 2015]. ^ Greece NGO. Geek Helsinki Monitor. LV: Minelres. ^ rs:Национална Припадност Припаднос [National origin affiliation] (PDF). RS: Stat. 29 November 2012 [2 January 2016] （塞尔维亚语）. ^ Serbia- a report by the European Roma Rights Centre (PDF). ERRC. 2011–2012 [30 September 2016]. ^ Giornata Internazionale dei rom e sinti: presentato il Rapporto Annuale 2014 (PDF) (PDF). ^ Population and Housing Census. Resident population by nationality (PDF). SK: Statistics. （原始内容 (PDF)存档于15 July 2007）. ^ Po deviatich rokoch spočítali Rómov, na Slovensku ich žije viac ako 400-tisíc. SME. SK: SITA. 25 September 2013 [25 September 2013] （斯洛伐克语）. ^ The 2002-census reported 53,879 Roma and 3,843 'Egyptians'. Republic of Macedonia, State Statistical Office. [2010-09-17]. （原始内容存档于2004-06-21）. ^ Sčítání lidu, domů a bytů. czso.cz. ^ Hazel Marsh. The Roma Gypsies of Colombia. Latino Life. [29 July 2016]. ^ Historical Dictionary of the Gypsies (Romanies). ^ Poland – Gypsies. Country studies. US. [28 August 2015]. ^ POPULATION BY ETHNICITY – DETAILED CLASSIFICATION, 2011 CENSUS. Croatian Bureau of Statistics. [21 June 2015]. ^ Albanian census 2011. instat.gov.al. [7 December 2015]. （原始内容 (XLS)存档于2015年9月24日）. ^ Roma in Canada fact sheet (PDF). home.cogeco.ca. （原始内容 (PDF)存档于2007-06-14）. ^ Statistics Canada. 2011 National Household Survey: Data tables. [11 February 2014]. ^ 《牛津英語詞典》：member of a wandering race (by themselves called Romany), of Indian origin, which first appeared in England about the beginning of the 16th c.
^ 49.0 49.1 49.2 49.3 刘浪. 羅姆人：被侮辱与被损害的千年命运. 《文史参考》. 人民网. 2011-01-05 [2017-02-04].